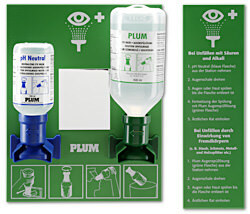 Especially suitable for workplaces where there is a risk of eye injuries from acids or alkalis. Not suitable for very dusty and dirty workplaces. Rinsing time: Approx. 7 min.